Three months ago, Garris Shrike was a name that sent the rumor mill into overdrive, with many believing that Woody Harrelson had signed on to play the former bounty hunter in Disney’s Han Solo movie – including Harrelson himself. Part mentor, part criminal, it wasn’t long before subsequent reports cast doubt on those rumors, and we now have confirmation from Woody Harrelson himself, who appeared on The Tonight Show with Jimmy Fallon to discuss Wilson and his experimental film, Lost in London. But just as those linked with Marvel and/or DC movies are badgered about costumed crusaders at every turn, it wasn’t long before the conversation veered toward Disney’s Star Wars universe. Harrelson was understandably coy when asked about the finer details of Phil Lord and Chris Miller’s 2018 anthology film, but the former True Detective star did take time to clarify the identity of his character. His name? Beckett. That brief description still aligns with the character of Garris Shrike, so it’s possible that the Powers That Be over at Disney and Lucasfilm simply changed the name of Woody Harrelson’s mentor figure all the while retaining Shrike’s core traits. We’ll find out one way or another when Phil Lord and Chris Miller’s origin story shoots for theaters on May 25th, 2018. 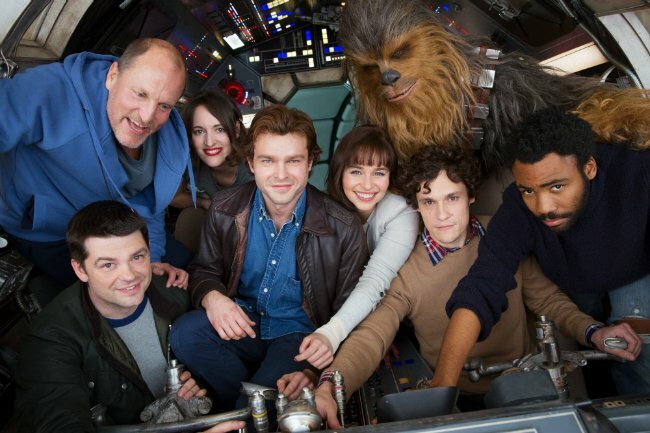 Among those on board for the Han Solo spinoff are Emilia Clarke, Donald Glover (Spider-Man: Homecoming) as the young Lando Calrissian, Phoebe Waller-Bridge, Westworld star Thandie Newton and Alden Ehrenreich as the aforementioned nerf herder. Assuming early reports hold true, we could well catch wind of the film’s official title at Star Wars Celebration next month, where the Mouse House is expected to lift the lid on the first teaser for Rian Johnson’s sequel, The Last Jedi. Either that, or it’ll be announced at D23.